Since the release of his first full length album, Irreversible, Grieves has been called a breath of fresh air, a breakaway phenomenon, and a lyrical mastermind. Touring constantly, Grieves stunned crowds all over the country with his distinctive voice, lyrical precision, and unparalleled style. Following Grieves' encouraging reception and a stint on the CMJ Top 20 Hip Hop charts, fans speculated on what would be next for the emergent artist. 88 Keys and Counting is the response. A joint venture with friend and renowned Seattle based producer, Budo, 88 Keys is a matured record with themes that will challenge fans old and new alike. Armed with a distinct and fluid sound that will delight your ears and rouse your cerebrum, Grieves' second effort is not to be overlooked. This album incredibly reminds me of Blu & Exile's '07 album "Below The Heavens", two unknown artists teamed up to craft an amazing mixture of rich beats, unique rapping style and honest lyrics. Take out the instrumentals and you're left with 11 songs, 2 of which have no rapping in it, that's right, Grieves sings and he's damn good at it too. "October In The Graveyard" is one of the two, took me a while to appreciate it but the beautiful beat and deep harmonizing made it into one of my favorites. This is a very unique release, Grieves is nothing like what we're used to hear, starting from his weird persona and geeky looks to what you would consider immature acting, but he doesn't try to be what he's not, his lyrics express that, and he does well in approaching this subject in the laid back "Identity Cards". No need to look for highlights in this album, there's no fillers nor bad songs, my favorite is the dark lullaby "Kings", amazing beat wrapped in the abstract lyrics. I just love the mature metaphors, the meaningful subjects, the visuals he describes, this album is definitely my favorite of 2008, it has everything I could ever ask for. 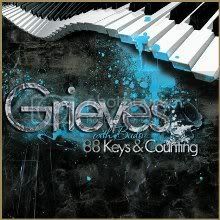 The piano has 88 keys and each key differs in sound, Grieves and Budo managed to expand into more than just that, it's uniqueness is what makes "88 Keys & Counting" a classic. Ok, confiare en ti, lo bajare. El disco de The Archive: Volume One, está excelente. Yeah dead links... Great artist! nice cd i downloades and it was very cool, more than i expect. check out my blog. This is an amazing album.I want to know ,Is this a studio album or a mixtape? Please lemme know. I'm very glad i found your blog men. You have very good material here. Keep sharing true hip-hop and keep it real. Peace. The first time I heard "October in the Graveyard" I thought it was really creepy&mysterious. But, the beats wouldn't get out of my head. Definitely one of my new favorites.